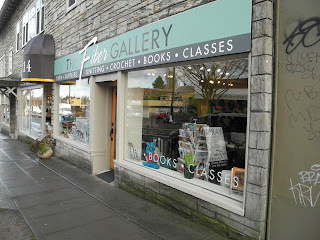 I want to give a shout out to The Fiber Gallery in Seattle, WA. 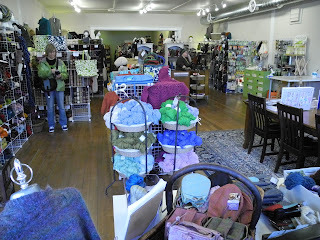 I visited the store with my cousin back in January and it is a wonderful resource for knitters - new and advanced. The store is in a new location - 8212 Greenwood Avenue North. The space really allows for an extensive display of yarn and knitting accessories, while creating a comfort space for knitters to gather and, of course, knit. The Fiber Gallery offers an impressive selection of classes. Their website is helpful as it includes a blog where finished projects are often posted. I am just getting back into knitting after many years. I have probably followed the same path as many 'returnees' to the art, as well as beginners. I have been making a lot of scarves. But the displays at The Fiber Gallery were simply too tempting. I simply had to purchase the yarn for a cute hat and a small shawl as well. The owner, Mary, was wonderful in helping me go over the instructions for both pieces so I could comfortably walk out of the shop with the confidence to work on my projects as I continued my trip. My only regret is that I don't live closer to Seattle so I could take more advantage of the classes that are offered. I hope if you are in the Seattle area, or passing through, that you will take the time to check out The Fiber Gallery.